On Tuesday, 03-05-19 at 2:17 a.m., Officer Martin and Officer Perdomo were dispatched to the report of a disturbance involving a knife at an apartment on the unit block of Kent Court. The disturbance was between the 32-year old victim and his 23-year old brother in law. The 23-year old was arrested for assault with a deadly weapon and for providing a false identity to a police officer. The victim was unharmed. On Thursday, 03-07-19 at 9:37 a.m., multiple officers were dispatched to a burglary in progress at a residence on the 1000 block of Gellert Boulevard. The reporting party heard the doorbell ring three times and after not answering it, the reporting party heard the sound of breaking glass inside the residence. When the officers arrived, they surrounded the perimeter of the residence and met with the two reporting parties who were outside of the residence. Both of the reporting parties said their parents were still inside the residence. One of the officers reported there was shattered glass in the backyard, and it was unknown if the suspect had made entry into the residence. At the same time, other officers reported being involved in a foot chase with a subject less than 100 yards from the victim’s residence. Officers detained the subject, who a few weeks ago, was found by the reporting party in her laundry room. Officers subsequently arrested the subject, a 27-year old San Francisco resident, for two counts of burglary, obstructing/delaying, vandalism and for being violation of his parole. On Friday, 03-08-19 at 4:35 p.m., Sgt. Klier and Lt. Rolfes conducted a traffic stop on a vehicle at the intersection of MacDonald Street and Schwerin Street. 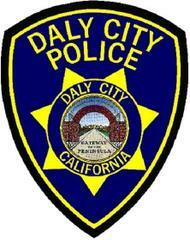 Both of the license plates on the vehicle were reported as stolen from Daly City. The driver, a 15-year old Daly City resident, said he recently purchased the vehicle. When Sgt. Klier asked the subject why the vehicle had stolen license plates on it, the subject remained silent. The subject said he was on his way to drop off the vehicle in the City. When asked if he had a driver's license, the subject said he did not. The subject was on probation for previous cases involving burglary and theft. Additionally, the victim who reported the stolen license plates lives on the same street at the subject. In searching the vehicle, Officer Klier found a small baggie of marijuana buds. The subject was arrested and booked for tampering with a vehicle, possession of marijuana, driving without a license, committing an adult offense as a juvenile and for a probation violation. The three passengers in the vehicle were released to their guardians. On Saturday, 03-09-19 at 6:38 a.m., a 57-year old Daly City resident was arrested for driving under the influence of alcohol after he was involved in a collision with a parked car. This occurred on the unit block of Miriam Street. On Saturday, 03-09-19 at 9:47 a.m., Officer Edwards was dispatched to the area of Woodrow Street and Citrus Avenue on a report of a male who was pepper-sprayed and screaming. When Officer Edwards arrived, she saw the victim was being treated by medic staff for the pepper spray to his face. The victim, a 27-year old Lyft driver from Fremont, said he received a message on his cell phone from a female he saw on an on-line dating site called “Skout”. The female stated she was in the same area as he was and would like to meet. The female asked the victim for $100, and the victim said it was illegal and he was not looking for something like that. The victim told the female he was only looking to be friends. The female said that was fine and to meet her at the BART station. The female then messaged the victim and told him to pick her up at her house on the 300 block of Citrus Avenue. When the victim arrived, he did not see the female and stopped his vehicle to wait for her. While he was stopped in his vehicle, the victim said two females approached the vehicle from the rear. The female from the dating site opened the passenger door and sat inside the car. The other female sat in the back seat. The victim started driving and was following the female’s directions. The victim said as he was driving, the female moved from the front seat to the back seat, and then all of a sudden, he was pepper-sprayed while driving. The victim said as he turned to look back, he tried to grab the female, and the other one began punching him. One of the females grabbed his cell phone and they left the vehicle. A resident on Citrus Avenue saw a scuffle and thought the male was attacking the females. The victim told the male that he was attacked and was trying to retrieve his phone but had difficulty seeing due to being pepper-sprayed. Our investigators were able to piece together information the victim had provided involving one of the female suspects, and on 03-13-19, they arrested a 16-year old from Lower Lake for robbery, being a minor in possession of tear gas and committing an adult offense as a juvenile. The investigation is continuing to determine the identity of the second female suspect. On Saturday, 03-09-19 at 10:13 p.m., Lt. Brennan was driving southbound near the BART station when he saw a subject walking and holding a piece of foil up to his face with a lighter in his other hand. Knowing this is a common method of smoking and ingesting different types of narcotics, Lt. Brennan conducted a pedestrian stop with the subject. The subject immediately admitted to having Fentanyl. The 32-year old Livermore resident was issued a citation for possession of a fentanyl and for possession of drug paraphernalia. On Sunday 03-10-19 at 5:00 p.m., Officer Hyink and Officer Maddison were dispatched to the parking lot near the Outback Steakhouse Restaurant on a report of a possibly intoxicated male who was involved in multiple vehicle collisions. The reporting party said the suspect vehicle was actively being blocked to prevent the suspect from leaving. The reporting party gave a description of the subject and said he walked away towards the shopping center. Officer Hyink saw two subjects walking in the area, and he saw that one of the subjects had difficulty standing on his own. The reporting party positively identified the subject as the one he said was the driver who was involved in two collisions. Officer Hyink conducted field sobriety tests on the subject, a 47-year old Daly City resident, and arrested him for driving under the influence and for hit and run. On Wednesday, 03-06-19 at approximately 12:40 p.m., four unknown suspects stole four boxes from a FedEx driver who was making a delivery to the AT&T store on Gellert Boulevard. This investigation is continuing. On Saturday, 03-09-19 at 9:47 a.m., a 27-year old Lyft driver was robbed of his cellphone by a female suspect who pepper-sprayed him. This occurred on the 300 block of Citrus Avenue. See “Notable Reports” for more information. There were two residential burglaries during the past week. On Wednesday, 03-06-19 between 12:00 p.m. and 1:00 p.m., an unknown suspect pried to front door to an apartment on the 600 block of Sylvan Street and took travel documents that were under the mattress and money from a backpack. On Thursday, 03-07-19 at 9:37 a.m., a residence on the 1000 block of Gellert Boulevard was burglarized by a 27-year old San Francisco resident who was later arrested for the crime. See “Notable Reports” for more information. On Saturday, 03-09-19 between 7:55 p.m. and 10:00 p.m., an unknown suspect broke into a locker in the men’s locker room at the 24-Hour Fitness facility and took a victim’s wallet containing credit cards/debit cards, U.S. currency and a California driver’s license. The victim received several text messages/alerts on his cell phone from his bank advising him that the credit cards were being used at various stores. This investigation is continuing. On Sunday, 03-10-19 at approximately 6:50 p.m., the Bed Bath and Beyond store was the victim of a commercial burglary. The details are unknown, as the report is not yet complete. There were eight vehicle burglaries during the past week. •	300 block of Cerro Drive—a stereo, deck, CD’s and currency was taken from a 2003 Honda Civic. The method of entry is unknown. Occurred on 03-04-19 between 3:00 p.m. and 6:00 p.m. **On-line report made. •	Skyline Plaza parking lot near Dim Sun King—a wallet containing cash and identity cards was taken from the front passenger seat of a 2005 Toyota Corolla. The right front window was smashed. Occurred on 03-04-19 between 6:50 p.m. and 7:00 p.m.
•	Unit block of Skyline Drive—a backpack was taken from a 2013 Ford Edge. An unknown window was smashed. Occurred on 03-04-19 between 7:10 p.m. and 7:13 p.m. **On-line report made. •	Moonstar Restaurant parking lot—a Jansport backpack containing school homework was taken from a 2017 Mazda CX5. The right rear window was smashed. Occurred on 03-06-19 between 6:30 p.m. and 8:50 p.m.
•	Serramonte Shopping Center parking lot (“East lot”)—nothing was taken from a 2018 Range Rover. The front passenger window was smashed. Occurred on 03-06-19 between 8:00 p.m. and 8:24 p.m. The victim’s laptop on the passenger seat was not stolen. •	Koi Palace parking lot—a backpack containing miscellaneous clothing and a gold bracelet was taken from a 2017 Ford Explorer. The rear window was smashed. Occurred on 03-06-19 between 6:20 p.m. and 8:30 p.m.
•	6000 block of Mission Street—nothing was taken from a 2003 Ford Ranger. The driver’s door lock was pried. Occurred on 03-07-19 at 7:30 a.m.
•	Home Depot parking lot—a Lululemon backpack containing an Apple MacBook Pro was taken from the front passenger seat of a 2004 Dodge Ram. The right front window was smashed. Occurred on 03-09-19 between 8:20 p.m. and 8:50 p.m. There was one vehicle stolen and one attempted stolen vehicle during the past week. •	300 block of Park Plaza Drive—a 2009 Yamaha R6 motorcycle. Occurred on 03-05-19 between 12:00 a.m. and 3:30 a.m.
•	MacDonald Avenue/Talbert Street—a 2000 Honda CRV. Occurred between 11:00 a.m. on 03-10-19 and 2:00 p.m. on 03-12-19. The suspect pried the ignition but was unsuccessful in stealing the vehicle.